Protect and organize your tweezers with the Sugarlash PRO Tweezer Roll! With a removable roll, and room for up to 10 tweezers, this versatile tweezer case is perfect for the on-the-go lash artist. When it comes to keeping your sanitized tools organized (stylishly!) and protected against dirt, dust, and debris between clients, the Tweezer Roll has you covered. Fits tweezers 5-14cm long. How do I Adjust my tweezers? The thing about tweezers that technicians can sometimes forget is that they need to be adjusted to better suit your personal lashing preference and needs. Sometimes the tweezers just need a but of tweaking to be aligned properly and "set up" before use. This technique can also be used when someone drops their tweezers and bends them. Take smooth needle nose pliers, and squeeze the tips together to try and get more of the foot to clamp tight. Each side can be slightly straightened so the angle is a bit less and it closes more entirely. This can and should likely be done with any tweezer to set up its sweet spot for optimal lashing based on artists preference. If your tweezers have flattened out and lost there spring, you can close the tweezers with a pencil placed half way between the hinge and points to increase the bend. After this trick they should grip again. We recommend you store your Tweezers in a case or Tweezer Roll. You can find both of these products in our store. Lash Artists each have their own personal method of using and setting up their tweezers. Read below to learn how to adjust your new (or bent) tweezers to optimise your lashing technique. Great photo Desni! Thanks for the Love! Love the simple yet elegant look of this tweezer roll. It keeps all my implements secure with additional storage in the zipper compartment. Highly recommend! WOW Mlle! What a fab photo! I absolutely love my tweezer roll. Stores my tweezers beautifully! We are so happy to hear! I’m kinda bias because I love your brand and all your products! But I had to have the tweezer roll. It gives you a more professional look and when you unroll the bag it’s like what magic is about to happen! Dawm S. Reviewed by Dawm S.
I have collected a good amount of tweezers. I was just putting them into my drawer. 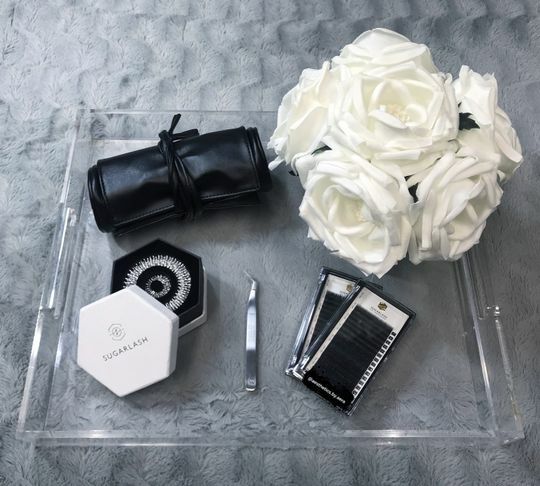 This rolling holder held my go to implements and the detachable bag holds my lash curler, wand, mirror, extra tweezers and scissors. Great combination to get your tools to stay safe and together. Woukd recommend to friends and family. Must have. 5 stars. Good quality and very practical. Was worth the money.